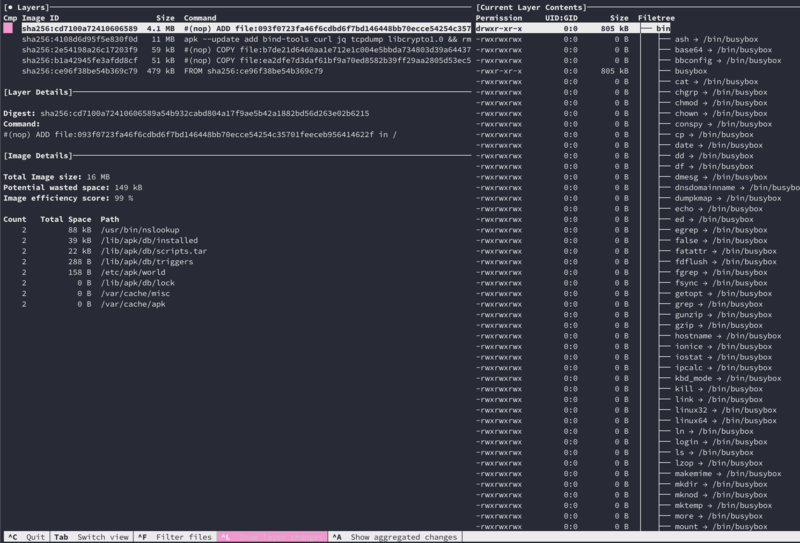 I've noticed with docker that I need to understand what's happening inside a container or what files exist in there. One example is downloading images from the docker index - you don't have a clue what the image contains so it's impossible to start the application. What would be ideal is to be able to ssh into them or equivalent. Is there a tool to do this, or is my conceptualisation of docker wrong in thinking I should be able to do this. This way, you can evaluate filesystem of the running container in the precise time moment. Container is still running, no future changes are included. This way, you can run your app using ssh (connect and execute what you want). The -it stands for interactive... and tty. You might want to do this and find out if there is any bash or sh in there. Look for entrypoint or cmd in the json return. This way works even if your container is stopped and doesn't have any shell program like /bin/bash. I mean images like hello-world from Docker documentation. And now the current working directory is the root of the container. This would give you the visibility of all the layers of an image and its configuration which is present in json files. Note that you don't need to specify that you want to copy recursively. I use another dirty trick that is aufs/devicemapper agnostic. and voilá you're inside the container. Basically you can as root cd into /proc/<PID>/root/ folder as long as that process is run by the container. Beware symlinks will not make sense wile using that mode. The most voted answer is good except if your container isn't an actual Linux system. Note: You need to run it as root. Here, 2465790aa2c4 is the short ID of the running container (as displayed by docker ps), followed by a star. You need to be root in order to cd into that dir. If you are not root, try 'sudo su' before running the command. Edit: Following v1.3, see Jiri's answer - it is better. This answer will help those (like myself) who want to explore the docker volume filesystem even if the container isn't running. This tells me that the local physical machine directory /tmp/container-garren is mapped to the /tmp docker volume destination. Knowing the local physical machine directory (/tmp/container-garren) means I can explore the filesystem whether or not the docker container is running. This was critical to helping me figure out that there was some residual data that shouldn't have persisted even after the container was not running. The Docker image will be mounted to /path/to/mnt for you to inspect it. The docker exec command to run a command in a running container can help in multiple cases. This is particularly useful to be able to do some processing as root in a container. The most simple way that I use was using proc dir, which is the container is must be running in order to inspect the docker container files. Not the answer you're looking for? Browse other questions tagged linux docker filesystems or ask your own question. how to install an app inside of running docker container? How to access a docker image? Are docker-hosted databases somehow exempt from backup best practices?